Mmmm....this will be the first of many posts on food. 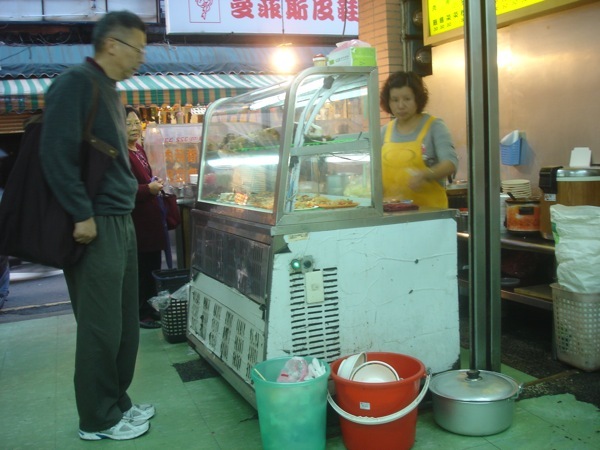 Taiwan is all about street markets and 小吃 (small eats). 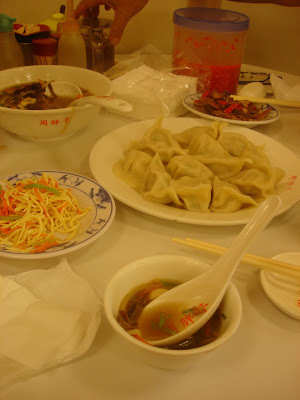 Portions are small, which is perfect for snacking, or you can make a meal of it by ordering several different dishes. 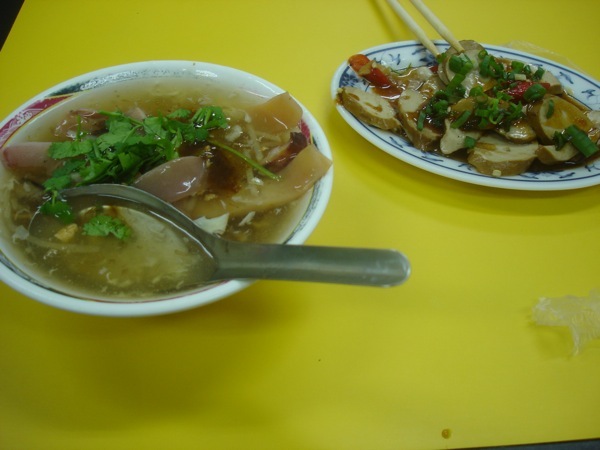 The dishes above are a cuttlefish soup and sliced vegetarian chicken - (It doesn't taste or look like chicken. 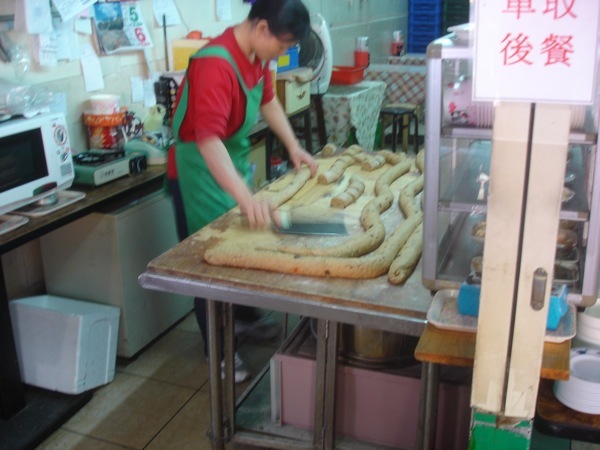 That's just what it's called, though I have had some surprisingly convincing mock meats here before). Dried cuttlefish (or squid) is reconstituted in a water/soda solution which gives it a different taste and texture from fresh cuttlefish. Don't knock it until you try it. I love this stuff, and it costs less than that can of high sodium Cambell's Chunky in your pantry. That's dad checking out the other dishes. That's not his man-purse, it's a shopping bag. Taiwan has a plastic bag ban, it's a loose ban, but it only really affects us when we go to the supermarket. If you don't bring your own bags, you have to buy one from the store. No big deal, I'm happy to use my own anyway. All the street markets, small shops and food shops still use plastic bags though, so there's certainly no shortage of extra plastic sacks at home when you need them. I'm also happy to report that garbage collection is pretty similar to what it was back in Seattle; recycling, food waste and rubbish. Yay! Our building has a refrigerated room where they keep the food scraps bin. One day I'll document this, but let's get back to the food. 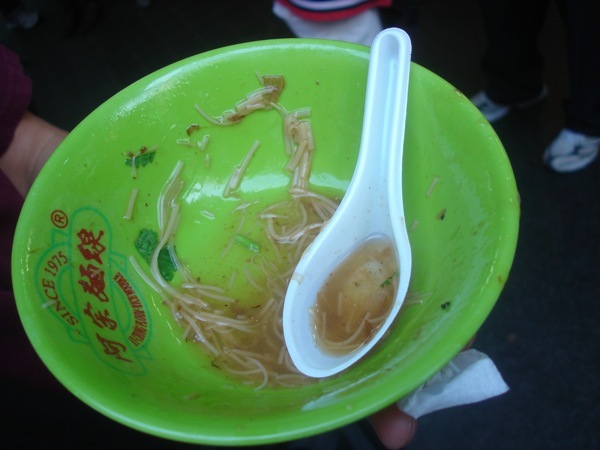 This was a noodle soup place we stopped at. No frills, no menu, just soup. Then you just stand right there on the sidewalk or street side and eat it with everyone else. And when you're done, put the bowls in a bucket and the spoons in another, easy. I'm in Taiwan! I arrived about a week ago after some stressful issues regarding travel visas, plane tickets, finding storage for my car, packing up, moving, and among other things, a failed attempt at obtaining a Washington drivers license. The grumpy woman at the DMV could use some customer service training. Well, all that is done, and I am now getting somewhat settled in my new home for the next few months. 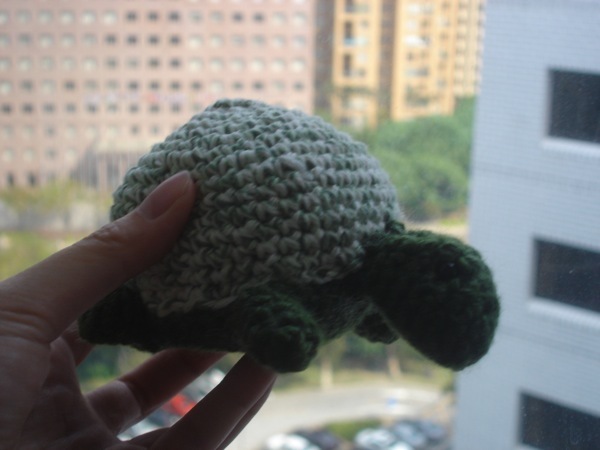 The plane ride was long, but I easily passed the time, nearly 24 hours, from Seattle to San Francisco to Tokyo to Taipei by crocheting a turtle and heart for my mom. I left Seattle early Thursday morning (many thanks to the wonderful James and Aileen!). The entire trip to Tokyo was daylight, so I didn't feel the need to sleep...not that I could have slept much. I don't think they could have gotten away with any less leg room in coach. My knees touched the seat in front of me, and I don't consider myself unusually tall. 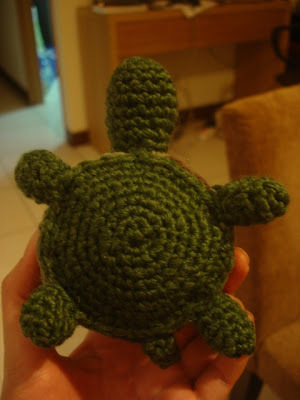 This was only my second time making amigurumi, so I was still quite slow. 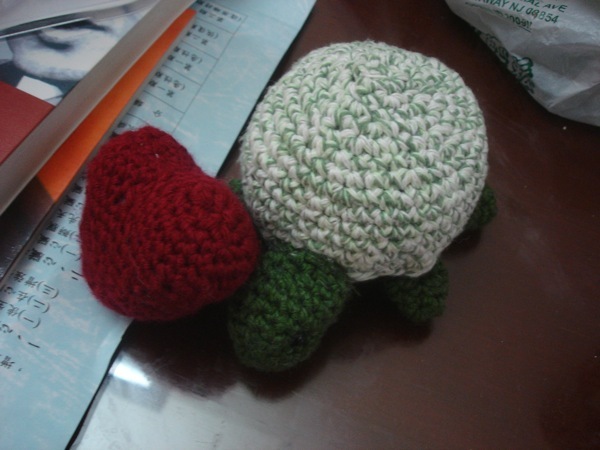 But I did manage to finish both the turtle and the heart before I landed in Taipei, which was all that mattered anyway. 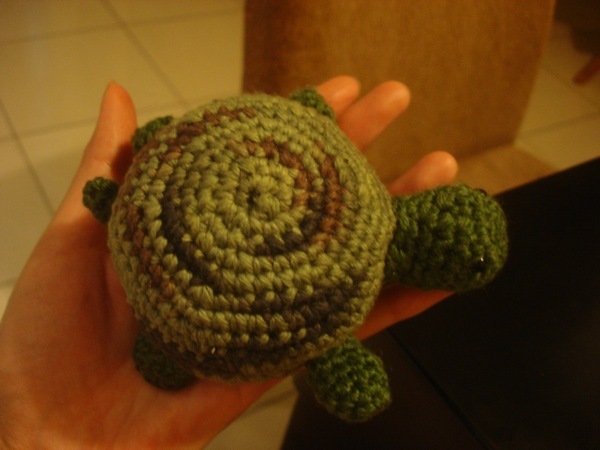 During the first week, I made a second turtle with different yarn. 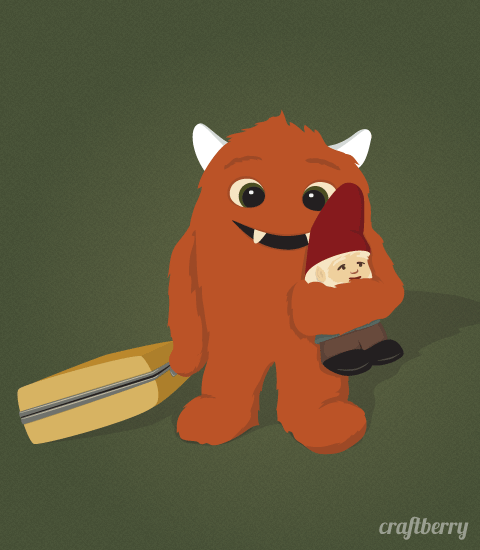 Cute, eh? The pattern is free here. In other news, I have some more photos that I will post when...um, later. I'll be in Taiwan for several months, so that should keep things pretty interesting. 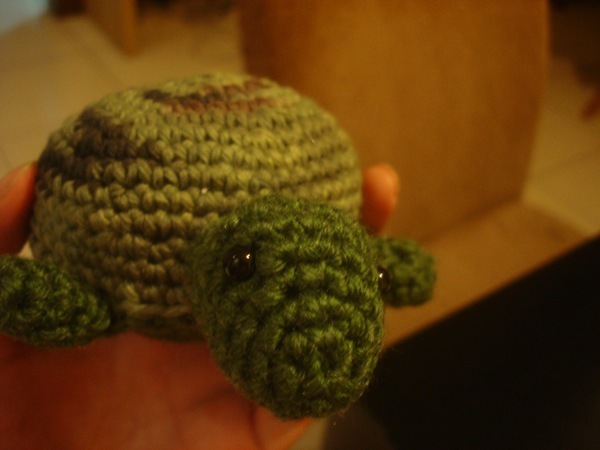 My etsy shop is closed for the time being :-( In the meantime, I've started taking a picture (when I remember to) at the top of every hour of what I'm looking at. It's an experiment; we'll see how long it goes, but for now it's kind of fun for me to document some mundane everyday activities that normal don't normally get photographed. You can view them here. 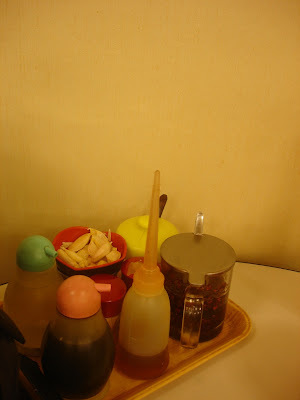 It's not live blogged because I don't have a mobile phone, but I'll upload the photos daily.